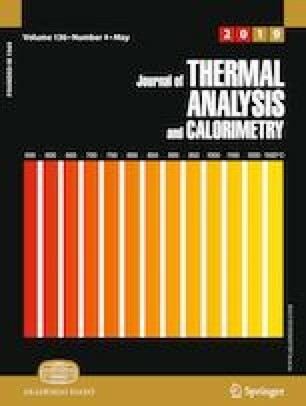 Solid samples obtained from 4-nitrophenol and aliphatic amines, in excess of amine, were submitted to thermal analysis. The TGA/DTA showed two endothermic events, with exception of tert-butylamine, which showed three endothermic peaks. The first event was the melting of the ionic salt, which temperature does not follow a pattern, and is maxim for ethylammonium minimal for butylammonium salt. For methylammonium and ethylammonium, the fusion is followed by mass loss corresponding to one amine by 4-nitrophenol, while for the others ammonium salts, this event marks the beginning of the mass variation, that is maintained until the decomposition of the 4-nitrophenol at 485 K. The temperature of the event depends of the length of the chain of the amine, while the second occurs at the same temperature for all amines. The authors are grateful to Embrapa Florestas, CAPES and CNPq.